Sometimes it’s not just lemons life throws our way. Sometimes life comes at us with a Medieval flail. So, what do we do? Life is certainly no respecter of persons when it comes to trials and tribulations. We all encounter them and, for some, every day presents new ones. I have in recent years observed all three of my siblings, as well as their spouses, experience serious health concerns, and every day is a trial for most of them. Personally, I marvel at their resilience. The same is true of my Sunday school class; many of our members and their extended family and friends face serious health issues. Some on our prayer list barely recover from one health issue when they are faced with yet another one. I have both seen and experienced the rewards of a committed prayer group—healing takes place, brokenness is mended, love is felt and grows. While I have experienced times of doubt, I could not imagine facing the difficulties in life without a belief in God. A couple of years ago, I experienced an event so painful that in the first few weeks, I was not sure I would recover. Betrayal on any level is painful, and betrayal of trusted associates will rattle a person to their core. Looking back on the event, I consider myself then in contrast to now. 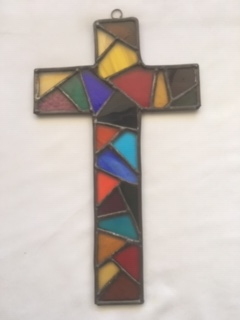 Initially, I was like stained glass, shattered and without purpose, but God picked up the pieces, wiped away the blemishes, and put them back together, all while reminding me of God’s unfailing love. In an often harsh world, there is always the cross. Christ loved me enough to die for me. Let me love him enough to live for him. Sandra Jones Cropsey is a playwright, novelist, and children’s writer. Her novel Who’s There was a finalist for the 2008 “Georgia Book of the Year” and was produced as a play in 2010 by the Main Street Players. In 2009, she received a grant to produce her children’s story, Tinker’s Christmas, as a radio drama. Presently, she is working on scheduling a reading of her new play, “All My Trials, Lord.” She writes at cropseyauthor.com.